Syria’s southern province of Daraa has suddenly experienced a surge of violence after rebel forces have launched a full-scale offensive dubbed ‘Death over humiliation’, causing much concern for the local population and the United Nations. The Office of the UN Secretary General is “concerned” by the escalating situation in Daraa where over 9,000 residents have fled their homes according to Farhan Haq, the deputy spokesman for the UN Secretary General. Most of the refugees have escaped to nearby farms or villages southeast of Daraa city; regrettably, the Office for the Coordination of Humanitarian Affairs (OCHA) anticipated thousands more would flee in the coming days if clashes did not grind to a halt. The Daraa rebel offensive is led by two insurgent coalitions, namely Hay’at Tahrir al-Sham and Southern Front. The former is composed of newly merged jihadist factions while the latter consists mostly of moderate Islamist groups. Around 150,000 non-combattants live in Daraa which was one of the first cities in Syria to witness demonstrations in early 2011. Terrorists created a new front in the south west because they know that, in the future, only Israel will keep surely supporting them . Israel can only support them along the Golan border. Receiving open Israeli help will make any group outcasts among Arabs. So Jordan is needed for more coordinated help. p.s. After their last defeat about a year ago the “sponsors” cut down on SF support. Recently Jordan was rumored to talk about their inclusion in the peace talks. A higher SF leader selected for the talks was assassinated. Now the joint offensive of SF and Nusra. All a mystery to me. Ok. Take Your word for it. You know Moassd’s ways. Blink. Come on mon amie – it is not only propaganda – and she has a point. While IMHO Israel also has a right to live. Because the Zionists that are cause of many current problems are a minority there by now. You IMHO see Israeli actions too uncritical very often. Vous avez bu ou quoi ? Cher Françoise, You are so polite. A votre santé. Or do You prefer baguette? p.s. Another opinion is no reason or excuse to insult. My reply was not for you, but for Daeshbags Sux who answered me, not by telling an opinion, but by spewing his hatred of muslims (specially maghrebians and palestinians)! It was so anusual that i wondered weather he was so exited! Ok. I was just surprised that You as an educated person asked whether any here was intoxicated. p.s. Notre amie is like a Mashreq Arab when it comes to PLO or any critique against Israel. IMHO His views are well founded – though I do not share all because I also know and evaluate differently. But then – I also see many things too critical or uncritical. They are no more rebels in the south : only terrorists. The Southfront units lost all their legitimacy by allying with HTS-Nusra. This move shows that their pledges to their sponsors were lip service. And that they were newer part or protector of any Syrian democratic movement. The US, UK, France and Jordan claimed this as reason for their allegedly non lethal support that killed and displaced millions of the Syrian people in six years of lethal war. Thea are only in the look mode. As Trotsky prophetised in 1933, economics took over the politics before the end of XXth century. In the same interview he predicted a 2nd WW before the end of the decade… Lever margin of politicians is somewhat limited. Consider all the money ALL states on Earth own, it’s less than 2% of the money that circulates. They already had done in 1933 IMHO. Yes it was predictable that Versailles was an error. It caused Black Friday, that helped Hitler’s rise and already had happened in 1933. As Marxist Trotsky excelled in political economy. So it was an easy prediction. WW II, the Yugoslav war and some wars in the near East were inevitable unless their political reasons were removed before they broke out. p.s. Most money is parked in national debt. Stern : you may know that the undersee Qatari gas field is half in Qatar EEZ and half in Iran’s EEZ. Guess who contracted the Iranian exploitation? French major oil company Total! Yeah, France supports the takfiri mess, for sure! l**o! At the same time ou Foreign Légion kills takfiris en masse in subsaharian Africa and the roaches do some of the biggest terror attacks ever happened in Europe. Time to stop smoking things stronger than tobacco and if not, consider stop snorting! Stopped smoking cigarettes and baguettes long ago. I prefer chips to oil shares, French capital taxes are to high and too hard to cut to the normal 15%. So I waun’t know. Smile. 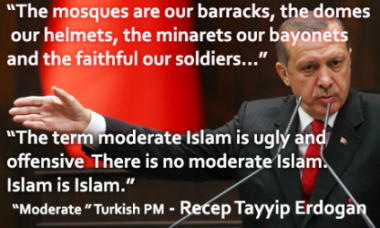 Soutfront is not really moderate Islamist. Parts are not Islamist at all. p.s. Good pic. Se repite la historia de Alepo, pero esta ves en el sur de Siria.